Sen. Bernie Sanders (I., Vt.) announced Thursday that he will no longer take part in the Women's Convention next week and will instead travel to Puerto Rico, following significant backlash over his opening-night role at the event and a "clarification" that he would merely participate in a panel. Sanders issued a press release titled "Sanders to Visit Puerto Rico, Thanks Women's Convention," in which he apologized to the convention organizers for his inability to attend. "I want to apologize to the organizers of the Women’s Convention for not being able to attend your conference next Friday in Detroit," Sanders said in a statement. Sanders explained the reason for his planned absence is "the emergency situation in Puerto Rico." "Given the emergency situation in Puerto Rico, I will be traveling there to visit with San Juan Mayor Carmen Yulín Cruz and other officials to determine the best way forward to deal with the devastation the island is experiencing," Sanders continued. 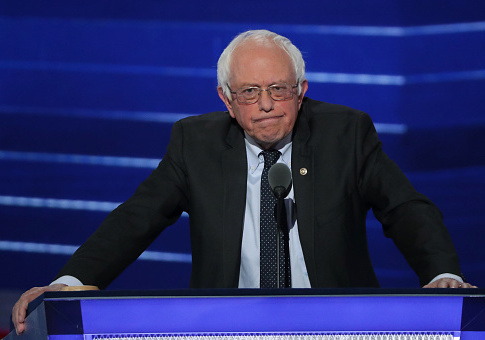 Sanders conveyed in his statement that much work still needs to be done. "The U.S. Congress cannot turn its back on the millions of people in Puerto Rico who, four weeks after the hurricane, are still without electricity, food and running water," Sanders said. In the second paragraph of his press release, he thanked board members of the Women's March organization, including Linda Sarsour. "My best wishes for a very successful conference," Sanders concluded. The Women's Convention, a three-day event in Detroit, Mich. in late October, is affiliated with the Women's March movement. Sanders was to address the crowd on the first night. Though a co-founder of the women's march defended Sanders's role to headline the first night, backlash over a man headlining the convention forced the Women's Convention to backtrack. In a statement, the Women's Convention apologized for adding to women's pain by announcing Sanders' appearance and said he would only be speaking on a panel discussion. Sen. Debbie Stabenow (D., Mich.) has since been announced to headline the convention. This entry was posted in Politics and tagged Bernie Sanders, Puerto Rico, War on Women, Women's March. Bookmark the permalink.